What is this parenting style called RIE? Celebrities have been hanging their hats onto the latest craze on the block: RIE parenting. A new day, a new parenting style, right? By now you’ve heard of, among others, attachment parenting, authoritative parenting, free-range and lawnmower parenting and of course helicopter, crunchy, wolf and tiger moms. The new kid on the block is RIE. This parenting approach, pronounced “wry”, is all about respect. The acronym stands for Resources for Infant Educarers and the method was developed by Hungarian-born Magda Gerber back in 1978. So it’s not exactly new, but RIE has seen a rise in popularity recently, praised by celebrities as a way to raise balanced, self-reliant children. The RIE style encourages parents to trust in their baby’s inherent abilities, to allow the child to learn at their own pace, to handle their feelings and to become self-reliant and self-confident at an early age. Madga stresses that children are natural explorers, able to initiate experiences and to learn from them. 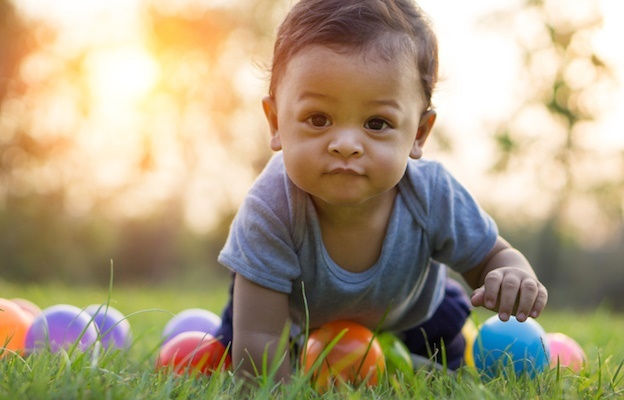 Therefore, parents and caregivers are encouraged to provide a safe and nurturing, but also challenging, environment for the child to enjoy uninterrupted play and freedom to explore. This means the creation of a ‘yes space’, or an area in which the child can play without limits. Usually this is a space in the home that is entirely clear of dangers, and includes simple toys and safe structures for the child to explore. Babies and toddlers are trusted to play alone, to develop at their own pace and to create their own experiences. Children, even newborn babies, are treated with the same respect as an adult in any given situation, and are included as active participants in child care activities, instead of being passive recipients. Nappy changes, feeding, bathing, dressing and other activities become opportunities for parents to engage and illicit cooperation from children, even infants. The child is treated with respect and informed ahead of time of all upcoming activities. Parents are encouraged to talk to their children as peers, asking permission where appropriate. For example when you need to clean your child’s face, prepare them by saying “I’m going to wipe your face now, because it needs a clean after you ate your snack.” Consider this: would you lean across the table and, unannounced, wipe a colleague’s face at a work dinner? RIE principles imply that if you wouldn’t do it to another adult, then you shouldn’t do it to your child. In RIE ‘baby talk’ is discouraged as being disrespectful. Studies show that babies as young as 6 months old can understand spoken words and match them to images. As a parent, you are their model of appropriate vocabulary. RIE promotes observation of the child in order to understand what the child is trying to communicate, to understand their needs. Correctly understanding the child’s message and feelings allows the parent to respond in the most appropriate way. RIE discourages unnecessary interventions in social situations as well as in learning and play, instead allowing the child to work out how things work and to respond to emotional situations by themselves, such as in an argument with another child over a toy. There are also clear guidelines to develop discipline. Parents are charged with setting consistent, clearly defined expectations, to follow through with limit setting, and to avoid negotiation or ‘waffle’. It’s best to choose when and where to set boundaries, as Madga stresses that when you don’t follow through, you convey that what you say isn’t always true, which fosters more testing of boundaries and less cooperation from the child. Children are not punished, but rather removed from the situation, or blocked from continuing the bad behaviour. Do not bribe or reward the child, instead reinforce good behaviour by smiling and showing appreciation. Several worksheets and guides are available on a number of websites and RIE blogs to guide parents to appropriate RIE responses to given situations. The style is not an easy one to follow if you aim to stick closely to RIE. Some principles appear opposed to other popular parenting techniques such as baby wearing (which is condemned as too restricting), and appear to encourage styles that are controversial such as sleep training or cry it out (CIO). Many of the typical parenting tools are actively discouraged, such the use of prams (which Magda has referred to as “a moving prison”) and the use of dummies or comfort objects (it is demeaning and babies must learn to self-soothe). RIE recommends allowing your child to cry and to avoid ‘over-comforting’, to foster competent, independent processing of emotions. However, many parents feel that children, and especially infants, also need to trust that their parents will assist them in times of need. RIE expects children to be treated like adults, which leads to the expectation that they will behave like adults. High chairs, for example, are frowned upon and babies must be sat at a tiny table on tiny chairs and eat like tiny adults. Any parent of a small child will know the chaos that this can cause! As parents we’re always looking for the best way to raise our kids into healthy balanced adults, but all it takes is five minutes with a baby or toddler to know that there will never be a one-size-fits-all method and that our parenting approach needs to adjust to our growing kids’ needs. RIE: celeb parenting trend has no room for toys? Tiger mom, helicopter mom or free-range parent? Do you follow RIE with your children? How do you feel about this parenting style? Send us your comments and stories to chatback@parent24.com and we may publish them (anonymously if you wish).